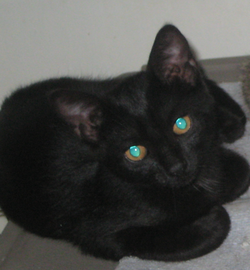 Raven is one of four kittens abandoned with their mother. She is very outgoing and sweet. She will settle down to snuggle you while you read or watch TV, but loves to play and run around as well. She is a foodie, and has absconded with a pancake, a french fry, and has sampled coffee before getting caught and shooed. Is this big hearted ball of chaos the one for you?